Incredible Learning Labs include kid-tested Bible Discovery Paks, lively gizmos, CD with music and sound effects, and unique sensory teaching tools. Everything you need to connect kids to Jesus--in fun, unforgettable ways! 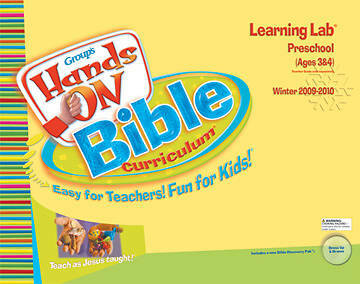 Bible Discovery Pak™ Vibrant gizmos create thematic ways to bring the Bible to life. You'll use these great tools in every lesson, every week. The Teacher Guide (sold separately) explains how and makes it fun and easy! Music, simple rhymes, finger plays, and lively tunes from the CD delight children as they learn to associate the love they feel in Sunday school with God's love.